You've done your research and bought the pressure washer model that best suits your needs, and now you're ready to blast away. Before the fun starts, it helps to understand your new tool so you can get the most cleaning power without turning it into a household hazard. A few handy tips can help you get maximum cleaning power while saving water. You need to regulate pressure to prevent any of these disasters, but if you err too much on the side of safety, you won't get much cleaning power. There's a good way and a much better way to find the sweet spot, and both involve balancing the pressure developed by the machine and the amount of water it delivers (the flow rate). 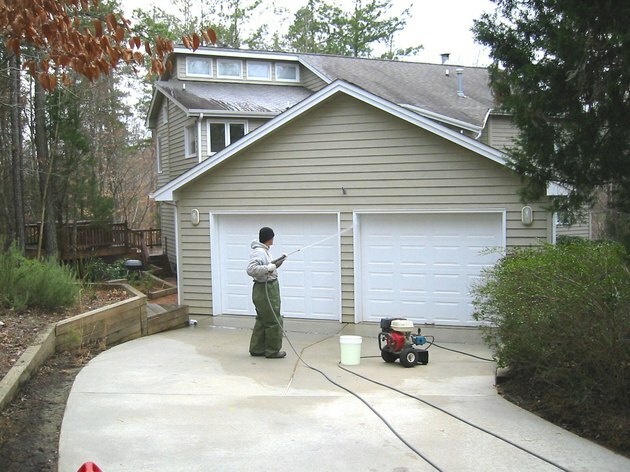 credit: Precision Pressure Wash Inc.
Pressure and flow rate both contribute to effective cleaning. Try a simple experiment with a garden hose to get an instant appreciation of how water pressure and flow rate combine for effective cleaning. Remove the nozzle and turn on the water to get a moderate flow, then cover the mouth of the hose with your thumb to get a high-pressure spray. When you do this, notice that you significantly reduce the flow rate. While you may be able to use the spray to dislodge ground-in sand from a board, there won't be enough water to wash all the sand away. The cleaning power of a pressure washer is measured in c_leaning units_ (CU). This measurement is the product of pressure, measured in pounds per square inch (PSI), and flow rate, measured in gallons per minute (GPM). Suppose you have a powerful machine that develops 4,000 psi, but the spray is highly restricted and only delivers 2 GPM. That's 8,000 CU, which is less than the 12,000 CU that can be delivered by a machine that develops 3,000 PSI at a more generous flow rate of 4 GPM. 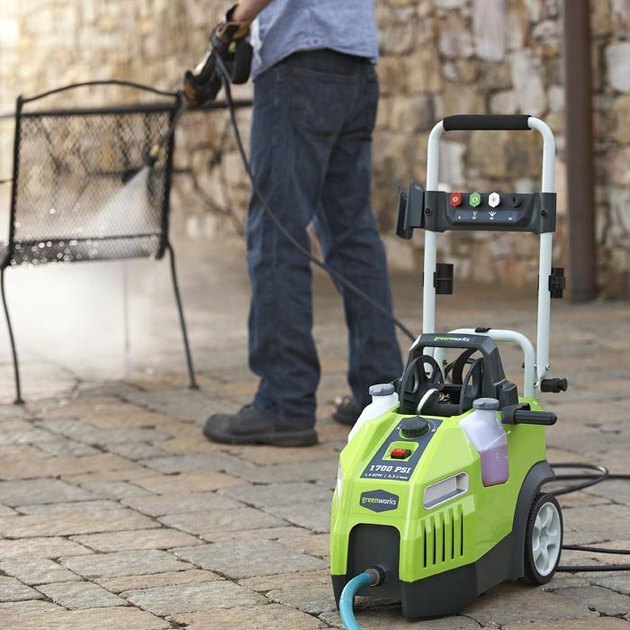 Many pressure washers—especially gas-powered ones—have an adjustable pressure control setting. Regulating pressure with this control also changes the flow rate and leaves the number of cleaning units unchanged. A better way to adjust cleaning power is to keep the machine pressure constant and choose a nozzle that is appropriate for the job you're doing. If you choose a nozzle with a wider aperture and spray pattern, the flow rate will increase while water-pump pressure stays the same. The result is more cleaning power. It's best to stay away from the red nozzle unless you absolutely need it. 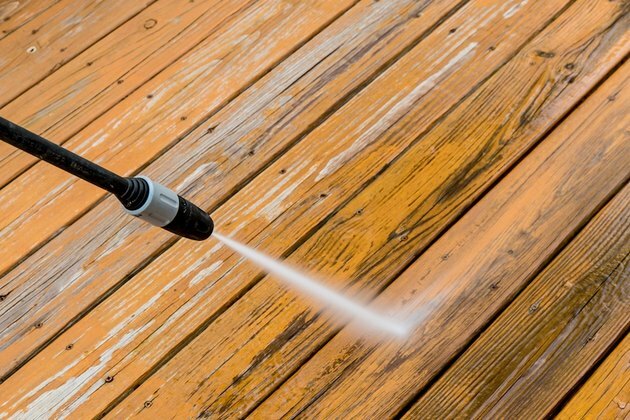 The concentrated spray is for industrial cleaning of metal, concrete and other hard surfaces, and it can quickly damage wood or leave unsightly streaks on other surfaces. Use an adapter to connect your pressure washer to an indoor hot water faucet. Anyone who has washed dishes knows the difference in cleaning power between hot and cold water. Water temperature also makes a difference when you're washing exterior surfaces with a pressure washer. Hot water speeds the removal of grease, oil and grime in general. You can get hot water directly from your water heater. Hook up the supply hose to a hot water laundry faucet or to the drain spigot on the water heater. 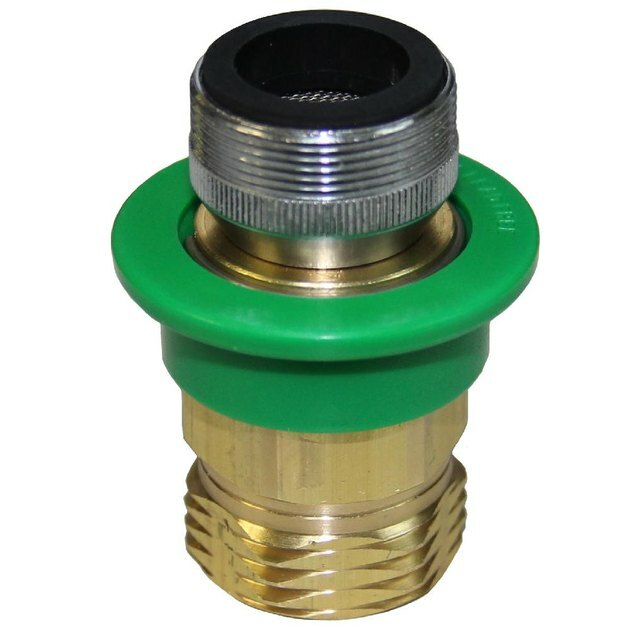 In a pinch, you can use a hose adapter to connect the hose to any faucet that has an aerator. If you keep the flow rate to around 2 GPM, the hot water in a 40-gallon tank will last for 20 minutes of continuous spraying, and much longer if you spray intermittently. That may not be enough to clean a deck or a fence, but it's plenty for cleaning exterior furniture, a small concrete patio or your car. If your home has an on-demand water heater, you have a virtually unlimited supply of hot water for cleaning large surfaces. Soap it down first and dirt and grime will slip away effortlessly. Every coin-operated power wash station has a soap setting, and there's a reason. Pre-soaping reduces wash time, and it results in cleaner, streak-free surfaces. Many pressure washers are equipped with a built-in soap dispenser. Be sure to use the soap recommended by the manufacturer. Soaps that contain bleach can deteriorate the rubber seals in some models, and using one may void the warranty. Use the black or blue nozzle when pre-soaping. It produces an extra-wide spray pattern that spreads the soap quickly under low pressure over a large area. If your pressure washer doesn't have a built-in soap dispenser, you can purchase a detachable foamer for a little over $50. This comes with its own low-flow nozzle. Foam has the advantage of sticking to vertical surfaces, giving the soap time to work. It's preferable to regular soap for cars and outdoor furniture. You don't have to apply soap with your pressure washer. You can simply brush it on with a broom or mop, which is especially effective when pressure washing horizontal surfaces. Give the soap several minutes to work before you pressure wash, but don't wait too long. If the soap dries out, it will be harder to remove. Avoid furring and splintering by keeping the nozzle 4 to 6 inches away from wood. Every primer on pressure washing contains the same warning, and it's worth repeating: Don't get too close to the surface you're washing, even if you're using a wide-pattern nozzle. There's always a danger of splintering wood, chipping old mortar or concrete, or cracking vinyl—but that isn't the only hazard. When you hold the nozzle close to the surface you're washing, the intense spray removes a narrow band of dirt and leaves the surrounding surface untouched. The result is light and dark bands that you can't camouflage by additional spraying. When cleaning siding, holding the nozzle too close can have the extra disadvantage of forcing water behind the siding material, and that can lead to extra repairs. The best practice is to hold the nozzle about a foot away from the surface you're cleaning when you pull the trigger and move the tip incrementally closer until you find the sweet spot, which is usually 4 to 6 inches away. Maintain a uniform distance as you clean, and you'll get the best results.